Is it Possible to Fully Become Another Nationality? Some believe you are only the nationality of your birth country. Some believe you can be the nationality of your host country. Some believe you can be a global citizen. Some people only live in one or two countries in their entire lifetime, while some others can live in a handful or twenty or thirty countries in their lifetime. The ability to go through the process (or bypass) culture shock, adapt and take on a different nationality is different for different people. Some may think it's easier for kids to do this, some do it quite easy as adults. And, the adaptation process is different for different people. I am not certain any one person can adapt, adjust to and accept everything they encounter in their host culture or adopted country. It's hard to accept everything in our birth country, even if we never move out of our place of birth our entire lives either. And, that is normal and helps social change! I'd like to share a few examples of how I have seen a few people in my life adapt to a different nationality other than their identified nationality of birth. A Changed Passport = A Changed Nationality? Many US Americans think of this because in the US it is completely possible to take the path of citizenship, adapt and adopt the US culture and take up citizenship with a naturalization ceremony and change of (or addition of) passport (for dual nationality countries). I know many people, including some of my own family members, who have taken this path. Some know in their heart of hearts they are completely American. Some have learned and become fluent in the culture and language, while some have not. There are many ways to be American, and not everyone can adapt and adjust to everything. Some argue, are we a melting pot or a salad bowl? I think it's up to the person and how they can cope up with the change. But does the shiny new American passport and US identity cards flip a switch to being 100% US American? For some, yes. It's fully embraced. For others, they claim they came in as an 'alien' and always feel like an alien no matter how much of the culture and language they have adapted and identified with. They feel others always see them as an outsider. So no matter how much they feel they fit in and see themselves as an American (an insider), they are constantly reminded by others they are not. Then there are those who took citizenship for practical reasons. Maybe it's easier to travel internationally, or they came to work in the US and citizenship provided them a secure way to stay here (stop worrying about visa and green card renewals), or they had children in the US and took up citizenship so the entire family are US citizens. Some people in this category, just like any other category have a range of adaptation and feelings about becoming American. Many countries in the Middle East allow expat workers to come in, raise families and live lifetimes in their country, but there are limited to no paths to citizenship in countries such as Kuwait, UAE, and Qatar (ways to get citizenship could include a father who is a citizen, being a Muslim, living in the country 20-30 years, and others). There is no concept of 'anchor baby' there as children born in these countries often would not become citizens by default. Yet, many of these families, and the children live pretty much like locals in these countries, learning the local language, growing up and around local people, having a deeper understanding of the local culture, and maybe in some cases actually feeling they are 'from there.' But since local law dictates they can never become citizens, they feel as if they don't belong from there or from their passport country. They are always living on a wave, so to speak. And, when they go back to their native countries for a vacation or to study or to live, the locals there don't completely accept them there, either. They again feel as if they belong no where, but at the same time feel they belong from their native land, because at least there in a way they can blend in because they may "look more like" others from there. I met many Kerala natives who were born and or raised in various Middle Eastern countries (Non-Resident Keralites, NRKs) who moved back to Kerala as adults. Hearing their stories always intrigued me. But the accent, dress, walking style or something always gives it away. Many ask me if I like India or the US better. I actually secretly despise this question. I understand why people ask it. I always think a better question is, "What do you like most about India/the USA?" When people find out I don't like this question, they ask me why. I say, "Well, what if I asked you a similar question, like, 'Do you like your native place or Bangalore better?" Then they get some context. Once anyone has lived away from their native town or hometown, a connection of some kind is formed with our new home (and it may take time to call that new place a home, but for some of us, some refuse to call our new residence a home - which can lead to resentment depending on how long we are there), and we are grateful to our adopted town or city which has given us some good experience and, hopefully, good opportunities. So, to choose is like to negate one over the other, to negate part of our lives in that place as if our life in the other place was always better than in our adopted home. I have lived in several cities in the US and in India. Each city, each country, has it's own flavor. It's own unique charms and personality. I am grateful for each place I have lived in. While no place is exactly utopia on Earth (as life is life everywhere, being an expat doesn't negate that or make it more glamorous), each place holds a special place in my heart. Life in each city or country has contributed to how I look at the world, my personality and who I am as a person. The first time I lived in India in 1998, I had a student visa. This visa and my life there at the time was pretty much like a visitor and a temporary resident. The second life in India was in Kochi between 2011-2017. First, I had a PIO (Person of Indian Origin) card, followed by an OCI (Overseas Citizen of India) card. These types of 'visas' are not available to all foreigners who come to India. (An example of a PIO card is pictured at the beginning of this article.) These visas are for foreigners married to Indian citizens. Also children born outside India (who have foreign passports), NRIs (Non-Resident Indians) or Indian expats who take up citizenship outside India, and maybe a few other categories of people can apply for this visa. This visa allows holders to work, study and live in India without a requirement of a sponsor (other than a family member with citizenship). When some people came to know I had this kind of visa, some would exclaim, "You are pretty much a citizen now!" Then others would ask, "So, would you give up your American passport and exchange it for an Indian one?!" 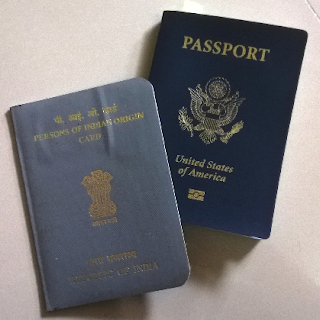 Somehow for most people who live between the US and India, having a US passport and an OCI card seems to be the best of both worlds. Once one gives up a US passport, it becomes more challenging to travel in and out especially for work. Redstone Dunes Hike, Nevada. See video. Though I don't have an Indian passport, do I identify as Indian? I often don't think I have a right to this identity. Possibly if I was born there to at least one Indian citizen parent who was born and raised there, I would feel more worthy of that kind of title. There is so much about India I don't understand. So much context to Indian culture I don't have. I may have more context to India and more of an experience traveling to India, doing business in India and living there than an average American. But, does that allow me to become "Indian?" 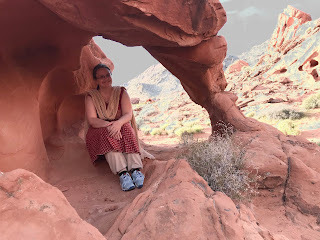 But, then some Americans think I am "less American" when those Indian English words come out of my mouth or I stand up when others come in the room when that is not a typical reaction here. Or how about those days I go hiking wearing a salvaar kamiz. In India, that would be an outfit that I would be expected to wear in some places, but in the US, someone may think I am culturally appropriating their culture. The line to walk can often be a fine one, but I just try to look at the situation, be respectful to others and true to myself. That is also what Authentic Journeys is all about! Learning to adapt or adjust to other cultures, work between and live between them without loosing who we are at our essence. If this makes sense to you and you'd like to talk more about how we can help you work more effectively across the oceans on your virtual team or live your best life abroad, get in touch with us today! Do International Students in the US learn American culture? Permission to Reprint: This article may be reprinted, provided it appears in its entirety with the following attribution (link included): Reprinted by permission of Jennifer Kumar, Cross-Cultural Coach at Authentic Journeys.